Spectators gather around the Metropolis Nuclear Plant, watching as the villain Radion uses his hijacked helicopter to fly around the facility.�He threatens to crash into it and blow it up if someone from S.T.A.R. Labs doesn't save him from his powers.�Lois arrives on the scene, and after talking with a television reporter for a moment, she turns back to the plant.�She watches in horror as the chopper descends towards the plant, when suddenly a streak catches the helicopter and places it one the ground.�With a burst of super speed Radion is pulled from the cockpit and hoisted above the plant.�In a single motion, the villain is tossed into the stack of the plant.�The crowd gasps as they see Superman kill the villain.�Overhearing them, the superhero lands beside Lois and the other reporter and tells them that Radion isn't dead, but throwing him into the plant did cure his powers.�Shocked, the two reporters ask who the hero is.�She replies that she is Supergirl, Superman's daughter. 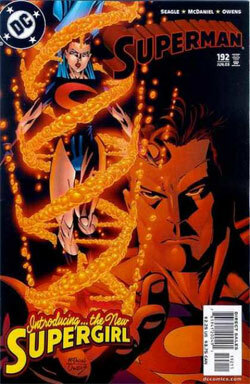 Supergirl suddenly turns away and leaps into the sky, indicating her super hearing and yelling a 'Bye' behind her.�Watching her leave, Lois and the other reporter wonder who the lucky woman that had Superman's child could be.�Lois just stares into the sky and says that she'll get the full story behind Supergirl. Across Metropolis, a robber dashes across the street, pursued by energy blasts.�From the sky, comes Viceroy.�Slamming the villain into the ground, Viceroy then turns to greet the people, as his mechanical O.W.L. ties the crook up.�Viceroy tells the crowd that he is the son of the original Viceroy from years ago, who was killed by Radion, and swears to avenge his father.�Viceroy tells everyone that Superman isn't like them, and the people of Metropolis need someone normal to take care of them.�Leaping into the sky, Viceroy is carried off by the O.W.L.�As soon as he is out of earshot, he asks the mechanical bird if he thinks the crowd bought it. In Washington, a group of scientists observe an erupting volcano when suddenly the eruptions become a little too violent.�The pair starts to flee down the mountain, when suddenly Superman appears, blocking molten projectiles and then catching a huge boulder disgorged from the volcano.�Hoisting the rock up, he carries it out to the ocean where he hurls it towards the horizon and then vaporizes it with his heat vision.�Returning to the volcano, he picks up the two scientists and carries them back to their base and out of harms way. As he stops the lava flow with a blast of super breath, he begins to overhear his wife talking to him...and telling him that if he doesn't get home immediately there will be hell to pay.�Soaring across the country, Superman finds his wife atop a building.�She is completely in tears.�He asks her what's wrong, but she just launches into a tirade of asking if it was Wonder Woman, or if another Kryptonian landed on Earth.�Superman finally gets her to stop, and she tells him not to play dumb, because she saw his daughter Supergirl.�He tells her he has no clue what she is talking about, but she just runs inside, telling him that she looked just like him. Down on the street, Clark catches up with Lois, but she tells him to leave her alone while she leaves him.�He continues to plead his innocence, but Lois just shows him the front page of the Star, proclaiming the appearance of Superman's daughter.�Superman asks if they can sit down and talk, and Lois points to a cafe selling Yes! In an alley nearby, a girl in glasses crawls out of a box, complaining about her sore head.�A cut rubs up against her leg and she picks the feline up, but a homeless man quickly seizes the cat and tells the girl that the cat is his lunch.�With a mean look, Supergirl lets loose with a red sun burst and knocks the man away.�Telling the man to never come back there she leaps into the sky. Inside the cafe, Clark tries to assure his wife, but she suddenly seems happy with the world.�She agrees with everything he says as she sips her drink.�Suddenly Supergirl lands next to them in the cafe. Seeing Clark she quickly proclaims "Daddy", and then turning to Lois she enthusiastically says "Mommy". Story - 3: Finally Seagle gets going on his storyline, but I still can't say I'm terribly impressed.�First off, not much happens this entire issue.�The entire issue consists of a brief scene against Radion, the introduction of the Viceroy, Superman vs. a volcano, and then the confrontation with Lois.�It just seemed stretched out to me.�I'm glad that Supergirl is finally out in the open though, because it has been really annoying the last few issues.�The part with Superman against the volcano was also a nice touch, because we really don't see Superman doing stuff like that much anymore.�Much of the issue seemed corny to me though.�The Viceroy is just one more character that we won't care about a year from now, even with his implied sinister intentions, and Radion was boring as well.�Plus there is a fifteen-year old Supergirl yelling Mommy and Daddy and 'kay.�It just seemed childish to me.�I also noticed that she says nothing to Lois the first time she sees her, and the second time she recognizes her.�That didn't make much sense to me.�Lois did also seem to fly off the handle a little too much.�She may have gotten mad at Superman and demanded an explanation, but for her to burst into tears and storm out just seemed out of character.�And this new Yes! storyline, it that's what it turns out to be, is going to be stupid, I'm sure of it.�Metropolis gets a new coffee drink that controls peoples' minds and makes them happy?�And no one notices this?�I'm just theorizing that this is what the scene at the end is leading to, and it seems pretty clear to me.�We don't need another subplot like this.�I don't care about the coffee Metropolis is drinking.�Despite all of my complaints though, it was the first issue of a new arc.�For that you have to accept something setting the scene a little bit.�Hopefully next issue will answer some questions.�One last thing though, the power description boxes continue to be annoying.�I don't need something telling me every time Superman uses heat vision. Art - 4: I did like the art a lot though.�The action scenes are nice, especially the scene at the volcano.�Overall the issue looks good.�Lots of color and nice bold action.�I still think some of it is a little too, I don't know, edgy?�But that's ok, and it is definitely growing on me as each issue comes out. Cover Art - 5: I really like this cover.�It's a nice introduction cover for Supergirl.�And I really like the red cast to everything.�There isn't any background, but in this case I think it adds to the cover instead of hurting it.�The art is also great.�Superman looks great, and so does Cir-el (except for her expression, but I just don't like the design of her in general, I miss Linda), and the pseudo DNA helix is also a nice touch, given her implied origin in cloning.�Plus, and this was probably the best part for me.�The old logo was used!�Not that horrible banner thing but the original logo.�Here's hoping they keep it around.